What is the best pond liner you can buy in 2019? There’s various materials available these days and all have their pros and cons. The demands are the same however. You need a hard-wearing liner that will stand the test of time. To help you in your search we have pulled together this ultimate buyer’s guide, and reviewed 5 top pond liners currently on the market. 10 ft. x 13 ft.
Amongst the various different liners available, there are five that stand out for those who are building smaller scale ponds, where rubber or plastic pond liners are most often used. There are pros and cons for one versus the other, but most agree rubber liners are more durable than plastic, and also easier to install as rubber is more flexible. However, as rubber is heavier, a job using rubber typically takes longer and requires more hands. The advantages of plastic over rubber are that it is lighter and less expensive. Even though rubber and plastic liners typically carry a 20-year warranty or a limited lifetime warranty, great care does have to be taken during the actual installation, and especially with rocks or stone, as the materials are fragile and tear easily. Once installed, they do tend to last. The Total Pond 10 x 13 Pond Skin Liner is ideal for medium sized ponds. Of all the pond liners reviewed, it was the most reasonably priced given all its features. It is 14.5 mils thick, and this size holds up to 500 gals. It is constructed with an ultra-durable polyester weave mesh, and is UV resistant to maintain a rich look. This pond liner is stronger than plastic, or PVC, but, lighter than rubber. The 10 x 13 version of the product weighs only 11.8 lbs. It is flexible and puncture resistant, which means there are fewer concerns of damage due to tools or rocks during installation. The product is eco friendly due to its polyester weave mesh construction which produces natural microbial growth. Therefore, the pond, fish, and plant life stay healthier and live longer. Additionally, whereas rubber and plastic liners typically come with a 20-year warranty, Total Pond offer a limited lifetime warranty, which means it is more likely to last the lifetime of your pond. There’s so many pros of the Total pond skin liner many have been mentioned above. It is affordable, yet durable and has a woven mesh construction designed to encourage microbial growth. The liner is also lightweight, (weighing 30% less than ordinary 20 mil PVC) making it very easy to work with when laying out your pond. The lifetime warranty is limited, which generally means that if the owners stray from best practices such as using an un-recommended product with the liner it could void the warranty. The Total Pond Pond Skin Liner is a great product, it is available through a good number of trusted retailers, both on and offline. It is well-made, reasonably priced, eco-friendly, and comes with a warranty. With all of that going for it, it makes for a solid choice. The Firestone EPDM 10×15 Rubber Pond Liner seems to live up to the maker of Firestone Tires’ name. This product is available through Amazon.com as well as other home and garden stores on and offline. This EPDM rubber is a pre cut and boxed pond liner that is very easy to work with. It can be used for building all types of ponds as well as other style water features such as fonts and fountains. This product does carry the Firestone name, and like the famous tire is constructed of heavy rubber. As stated previously, rubber is heavier, more durable and pliable than plastic which means it will last longer. Additionally, the makers indicate that due to the dark color of the product it is naturally UV protected. The liner is 45 mils thick, which adds to its durability, and is stated to be fish and plant safe. This product offers a limited lifetime warranty. The caveat to the lifetime warranty is if any non-recommended products to assist with installation are used, the warranty then becomes null and void. Additionally, while this product does seem to be as durable as the Total Pond liner, it is heavier at 45 lbs., which could make installation more difficult, and as the rubber is not punctured resistant there is a greater risk of tearing. While the product is described as “plant and fish safe”, there is no further information on the eco-friendliness of the product. Another downside to this product is the cost, which at the time of writing is more than double that of the Total Pond Liner. This is a fairly decent product, and while it is much heavier and more expensive than the Total Pond liner, it also should last just as long, if installed properly with no damage done during installation. The Aquanique Pond Skins 10×13 Pond Liner is made of PVC, is reasonably priced and available through Amazon.com, Walmart, Home Depot and other garden center stores. As the name suggest, the dimensions on the liner come in at 10 ft. x 13 ft, making this offering from Aquanique great for any medium sized backyard pond or water garden up to 500 gallons. The liner is also very thin at 14.5-mil, which makes it extremely flexible and much easier to handle when constructing your pond in the first place. This pond liner is lightweight, only weighing 11.5 lb. Like the Total Pond liner, this product is constructed with a weave mesh material. The makers claim it is puncture and UV resistant, and also eco-friendly in that it slows the growth of algae, making it fish and plant safe. This, yet durable 14.5mil construction making the liner east to handle during pond construction. Although this product is described as pliable, it is plastic and therefore prone to breaking due to brittleness, and while lighter, the material is simply not as flexible as rubber. There does seem to be many similarities to the Total Pond liner; however, none of the sites where the product is sold had any warranty information posted. Even though the Aquanique liner seems to have the initial features that make the Total Pond a winner, it is made of PVC, and while has some durability, it is essentially plastic, which means it can become brittle. The added worry of not knowing what sort of warranty the product offers is cause for concern too. Depending upon how much money there is to invest in a garden pond, the Anjon LifeGuard 15×15 45 EPDM Pond Liner seems to be an excellent choice. It is available through Amazon.com, Walmart, EBay, and Anjon Manufacturing. Durable and proclaimed as puncture resistant, (complete with exclamation mark within the marketing materials) the LifeGuard Pond Liner has a big backing with both landscape gardeners and home pond builders across the world. Used in a wide variety of applications, Anjon LifeGuard EPDM can be found in all manner of waterbased constructions, from Koi ponds to fish hatcheries, to public water features and more. The LifeGuard is made of the same durable synthetic rubber as roofing material, and it claims lasting durability. Plus, as it has no plastic in the fabric, therefore, it is brittle resistant. This product comes with the Underguard Geotextile Underlayment Combo to ensure long lasting protection against damage caused by rocks, as well as a long lasting seal for any medium sized water garden. The LifeGuard also has a lifetime warranty, which should mean it will last the life of your pond. The LifeGuard is no light weight. This product weighs over 70 lbs., which means it will take a great deal longer to install than the lighter weighing products. This product costs as much as three times the Total Pond liner which seems to be equal in durability. While the LifeGuard is a good durable product, it owes that to the fact of being rubber and extremely heavy, all of which makes it incredibly costly. Before making the investment in this product, be sure that you really want the backache of installation, and are willing to dig deeper into the pocket to cover the cost. The Beckett 12×17 Pond Liner is available through Amazon.com and Home Depot as well as other home and garden outlets. Manufactured by the Beckett Corporation, this PVC pond liner is 20 mil thick and is designed to be flexible and easy to install. Beckett have manufactured a pond liner that is made with precut PVC. As long as you have the same size pond, your work is literally cut out for you. The Becket Pond liner is lighter weight than rubber, but not nearly as flexible or durable. This product is 20 mils thick which are the primary claim to strength, and it is reasonably priced. This product while reasonably priced, only has a 15-year limited warranty. Given the material and the lack of a longer warranty this product would not be recommended for use with a water garden constructed of rock. Additionally, it is not puncture resistant and could easily become damaged during installation as well as wear. The bottom line on this liner? While it does have some positive points, the fact the other liners in our top 5 list are more user friendly as well as being more durable, means the Becket does falter in comparison. Building a pond in your yard has many benefits. They are aesthetically pleasing enhancing the value of your home, they provide nature’s best relaxation sounds and make for a beautiful feature for your garden. However, if you want your pond to last a long time, you are going to need a durable pond liner. Pond liners protect the pond and pond life, and of course serve to seal against leaks. without one the water will simply seep into the ground. Pond liners are available in rubber, plastic, enhanced soil, and natural clay liners. While budgetary concerns are of the utmost importance when undertaking any sort of home or landscaping project, choosing the product that will give the longest life should be the goal. 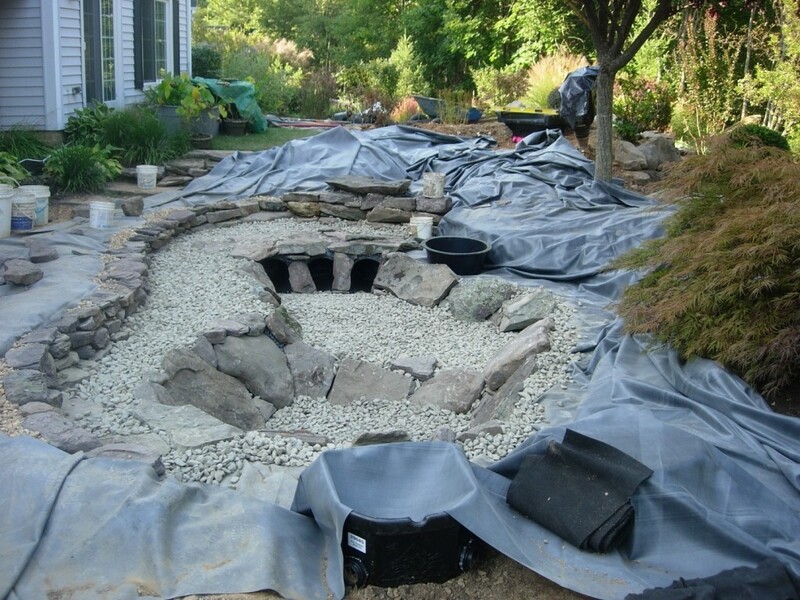 Obviously your liner needs to be waterproof and flexible enough to cover the inside of the hole for your pond. There are a number of materials available that fit the bill here. Let’s take a look at some of the more popular pond liners you can buy. In our opinion, LDPE (Low Density Polyethylene) liners offer one of the best value options when it comes to pond construction. LDPE is created via an ultra-tight weaving process, with the finished fabric being laminated on both sides. The coating is a UV resistant which makes it ideal for outside use as well as increase strength and longevity of the material. The process is relatively cost effective, meaning those manufacturing savings are passed on to the consumer. We mentioned strength – LDPE is also extremely tear proof. It also lightweight which makes installation easier, and with the material being flexible you can fold into the nooks and crannies of your pond design without issue. Overall one of the best pond liner materials you can buy. Related Content: What is the best pond pump on the market in 2019? PVC pond lining is another popular choice. Like LDPE, PVC is inexpensive and durable. It also has more elasticity than our number one choice liner material. The downside of this is that PVC is less tear proof. It is also heavier. The durability is good with PVC, however unless you get an especially treated PVC liner (such as our top pick Total Pond liner) the material is not particularly suited to very cold climates. Direct sunlight can also weaken PVC over extended periods. Another acronym for you; this time it’s the EPDM pond liner. EPDM is more expensive than the previous two options however it is one of the most durable synthetic rubber liners currently available. (It is also cheaper to produce that Butyl – see below). It is robust in the cold and is also resistant to ultraviolet radiation. If you live in areas of the United States with a wide-ranging climate, EPDM is worth considering. Butyl rubber is strong but less easy to work due to the thickness of the material. You also need to be careful with the types of fish you stock as the Butyl is toxic to some animals, (best avoided if you plan on having delicate Koi). In the past, the high natural rubber content made Butyl a popular choice with professional pond installers. However, these days the increased price (the polymer used in creating the material is very dependent on market forces; the demand for car tires is greater) and the proliferation of cheaper, yet versatile synthetic alternatives has seen the popularity wane in recent years. 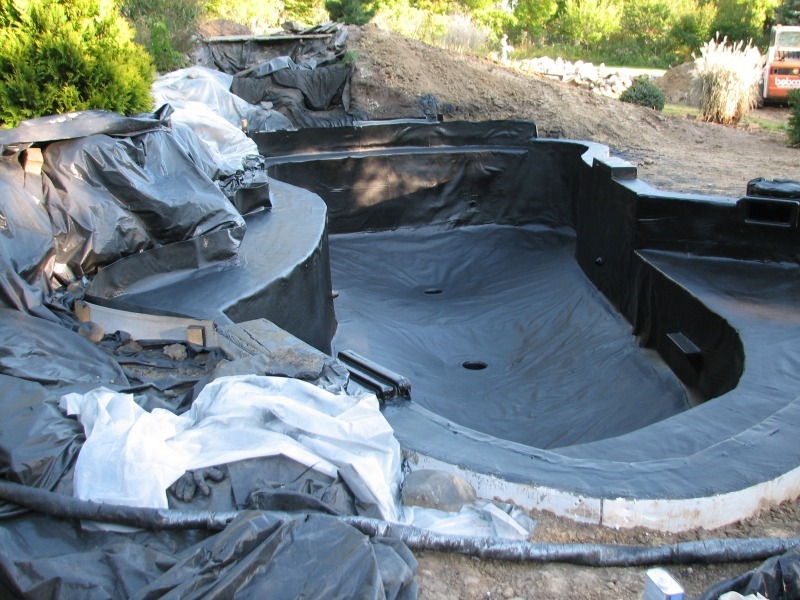 Flexible synthetic pond liners are normally dark in color so that they can no longer be seen once the water is added. A nice result of this is the fact the pond looks a lot deeper than it actually is. Plastic / rubber liners are also less intrusive than concrete or fiberglass constructions as they can easily be tucked in at the edges and covered in earth and foliage. Flexible liners are also great for meeting the demands of your pond design. If you have a pond with curves and interesting shapes, a synthetic liner can accommodate the flow of the pond a lot easier than a concrete or stone build. One of the most common problems with pond liners is poor installation. When liners are incorrectly installed there is the risk of soil erosion, and rocks and soil falling into the pond and causing damage. Obviously, lack of attention to detail can be a factor when it comes to installation. When taking on this task it is crucial that you have the proper tools and enough manpower to do the job. Additionally, take note of the liner’s weight and pliability. Rubber is heavier, therefore will require more help to carry and properly place. The last thing you want to do is to drag the liner across the bottom of the pond to get it properly seated. Even though most claim to be puncture resistant, that is simply not a risk you should be willing to take. When installing a water garden there are many factors to consider. You want to make sure that you have made the right decision when it comes to what is essentially the foundation to your new oasis. It is important to remember- high cost does not always mean better quality, and heavy does not always mean stronger. No one wants to build their perfect back or front yard oasis, fill it with Gold Fish or Koi, only to have to drain and disassemble it due to damage to the liner. In addition, if the liner selected is made of rubber or ordinary PVC, while it may be safe for fish and plant life, it is likely to generate bacteria and algae, causing the yard to smell. These are just a few of the considerations homeowners and contractors should entertain when planning a water garden project. While all the reviewed products will initially do what they are designed and marketed to do, which is provide a sealant for a water garden/pond, it is best to choose a product that will last the lifetime of your pond. Of the five products reviewed, the Total Pond Pond Skin Liner and the Ajon Lifeguard Pond Liner are of the highest quality materials and have the best warranty. However, the Ajon out costs the Total Pond by a significant amount, and is 60 lbs. heavier making installation more difficult. Both do come with a limited lifetime warranty, but for the money, and the ease of installation, along with a more eco-friendly material, the Total Pond Pond Skin Liner is by far the better investment.